The Ultimate DJ Performance Tool! Amidst a growing buzz throughout the DJ community, American Audio has announced that its long-awaited VMS4 Velocity MIDI Station, a 4-channel MIDI controller, will be available in July. Billed as the ultimate performance tool for today’s working DJs, the VMS4 is an amazingly versatile piece of gear that offers 4 selectable MIDILOG™ (MIDI or analog channels), so it can be used with a computer for digital DJ-ing or as a regular mixer without a computer. It doesn’t matter what kind of computer you have either, because the VMS4 is both PC and Mac-compatible, making it one of the most adaptable pieces of gear on the planet! The VMS4’s adaptability extends to software too. The unit comes bundled with popular Virtual DJ LE software, so DJs can get up and running right out of the box. Easy to use, Virtual DJ is an ideal software for newcomers to the digital world to get started on. But for those who prefer to use other DJ software programs — not to worry, the versatile VMS4 platform can accommodate those too. Downloads of MIDI drivers for all popular DJ software titles will be available on American Audio’s VMS4 website (www.vms4dj.com) free of charge, allowing the VMS4 to run smoothly with the most popular digital DJ programs out there. The VMS4 is not only versatile — it’s affordable. Although packed with features, it has a street price of under $500. This is an incredible value for a 4-channel unit that comes with Virtual DJ LE software included, along with 2 jog wheels, a built-in mousepad that allows DJs to make all of their selections right from the top of the unit, and 2 microphone channels with gain/treble/mid/bass EQs. Each of the mixer’s four channels is fortified with gain, treble, mid and bass controls. All of the audio control faders, knobs, switches, and buttons are smoothed, meaning no popping, wiper noise, or zipper noise. 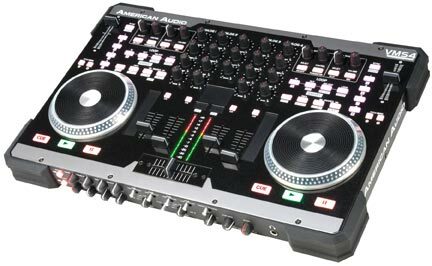 The mixer itself offers the option of being used with an Innofader replacement crossfader (sold separately), which is typically found in only the top professional gear. “With its wide range of premium features, there’s nothing like the VMS4 on the market, especially at the price point we’re offering it at,” said Tom Freret, National Sales Manager for American Audio. “But the most amazing thing of all is the VMS4’s versatility — its dual-purpose MIDILOG channels are selectable either as USB or analog channels, allowing it to be used by computer DJs or as a regular analog mixer. Plus, it can be used with any brand of DJ software. This was done to meet today’s need for audio gear that is flexible enough to serve a variety of functions. The VMS4’s versatility also becomes handy when a computer crashes, Freret added. DJs don’t have to stop the music when their computer fails them. The VMS4 kicks into an analog mode, where CD players or turntables may be used, or a DJ can use an external power supply. In addition to its performance versatility, the VMS4 also offers versatility in its appearance. DJs can personalize the look of their unit, thanks to the availability of customized skins, which can be ordered via the website www.styleflip.com. Among the VMS4’s other MIDI features are: 50 LED illuminated buttons (including 18 with dual blue/red LEDs), 34 assignable rotary controllers, 5 assignable linear fader controllers, 4 assignable rotary encoders, long-life MIDI-assignable touch strips, two 10-bit resolution pitch sliders, 62 assignable MIDI buttons and switches, dual MIDI controls on all buttons and switches, and dual 2000 point resolution touch-sensitive turntable search controllers. In addition to its many MIDI features, the VMS4 delivers some sweet-sounding audio options. Those include the ability to use it with sound cards; 24-bit 48 kHz of analog audio; 16-bit 44.1 kHz USB audio; 10-bit resolution on all analog fader controls; and selectable USB modes; 4 in 4 out mode for running software effects on phono/line analog channels, or 2 in 8 out mode for running 4 software channels and master recording. All buttons on the VMS4 illuminate in dark environments and only take 2 msecs to respond to a DJ’s touch (4 msec response on all rotary and linear faders). The MSRP of the VMS4 Velocity MIDI Station is $699.95. 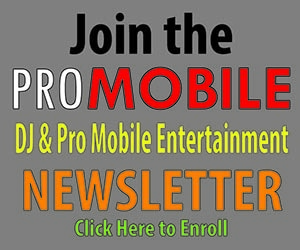 For more information, contact American Audio at 1-800-322-6337, or visit the company’s website at adjaudio.com.